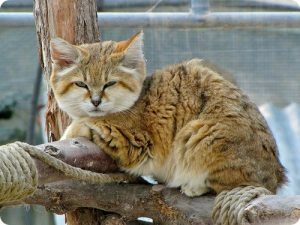 The Sand Cat is the only feline species found primarily in deserts. 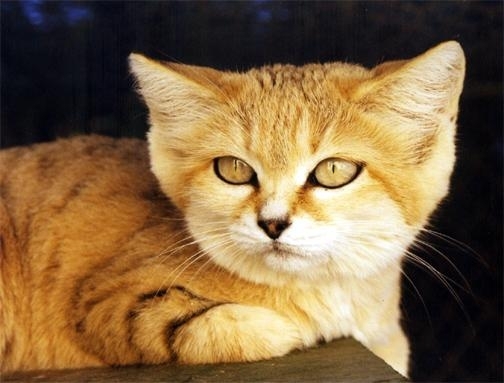 They are also referred to as Sand Dune Cats and are found in various regions of Africa and Asia. Different subspecies are occasionally referred to as Arabian Sand Cat and African Sand Cat, depending on their range of distribution. They have certain characteristic features in their appearance that distinguishes them from other wild cats. Size: Their head-and-body length ranges between 15 inches and 20 inches (39 cm and 52 cm) while the height from the ground to the shoulder can be anywhere from 10 inches to 12 inches (25.4 cm to 30.4 cm). The tails can be 9.1 inches to 12 inches (23.2 cm to 31 cm) long. Weight: The adults can weigh anywhere between 3 lbs and 7.1 lbs (1.35 kg and 3.2 kg). Kittens weigh around 1.4 oz to 2.8 oz (39 gm to 80 gm) at birth. Color: Their pale sandy colored bodies generally do not have any stripes or spots. The upper and lower lips, chin, throat as well as the belly are white in color. The tawny brown ears are tipped with black. The face is sandy brown with the lower part being whitish having two reddish lines running down from the corners of the eyes across the cheeks. The greenish-yellow eyes are circled with a white ring while the nose has a black tip. The limbs are marked with blackish bars while the buff tail has a couple of dark rings along with a black tip. The kittens are born with spotted reddish or pale yellow fur. Head: The two low set ears give the head a flat, broad appearance. Ears: They have pointed ears with triangular pinnae. The anatomy of their ears is quite different from that of other similar felids as the auditory bullae and the ear passages of Sand Cats are quite enlarged. Fur: Their whole bodies are covered in long thick fur with the winter coat in the northern populations being longer than those living in the southern regions of their distribution range. The hairs in their fur are 2 inches (5.1 cm) long in average. In North Africa, the cats are found marginally in the western regions of Morocco, including Algeria and the former Sahara Occidental. Their distribution range includes the Sinai Peninsula and extends to the eastern Egyptian rocky deserts. Sightings have been recorded in places like Libya, Tunisia, Niger and Mali. They are also known to occur in Majabat al Koubra and the Adrar mountains. The central Asian populations are distributed from the eastern parts of the Caspian Sea through the Kara Kum Desert. Their range includes the Ustyurt Plateau in north-west to the Kopet Dag Mountains, extending to the Kyzylkum Desert and Syr Darya River as well as some regions of Afghanistan in the north. Sand Cats primarily inhabit sandy and stony deserts. They prefer undulating flat terrain with thin vegetation, free of bare sand dunes. The animals are able to survive in extreme hot and cold temperatures from 23 °F (−5 °C) to 126 °F (52 °C), retreating into their burrows when it gets too hot or too cold. According to a radio-telemetry study done in Israel, these cats can have large home ranges. One male Sand Cat was found to be using an area as wide as 16 km2. The diet of these carnivorous mammals mainly consists of rodents and other smaller mammals. 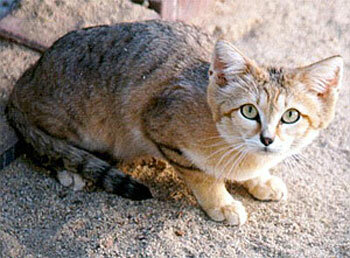 Sand Cats also hunt and eat small birds such as greater hoopoe lark and desert lark. They are known to feed on various desert reptiles including fringe-toed lizards, desert monitor, short-fingered gecko, horned vipers and sand vipers as well as various insects and invertebrates. Being permanent inhabitants of the deserts, they attain all the necessary moisture from their prey. But, they drink whenever water is available. They are solitary creatures living alone apart from in the mating seasons. 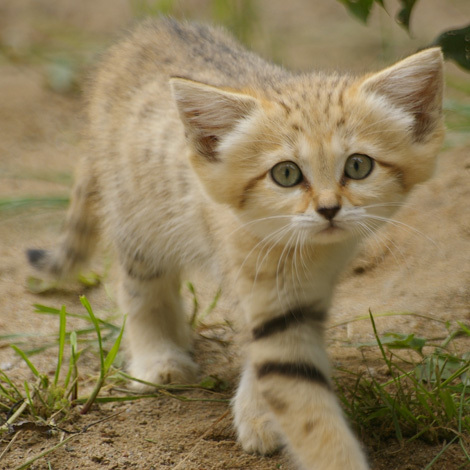 Sand Cats do not leave feces in exposed places like most other felids. They are territorial in nature and use urine spraying and claw marks to mark their territories. The cats dig burrows in the sand or use abandoned porcupine and fox burrows. Sometimes, they may even inhabit rodent burrows after enlarging them. Like most other feline species, these cats remain active during nighttime. During the winter months, they remain in the sun all day, becoming exclusively nocturnal during summer. Their hunting and eating habits are similar to those of other wild cats. They are known to bury the remains of a prey in the sand and consume it later. Reptiles like venomous snakes and various birds of prey are known to prey on these cats. Other predators include different carnivorous mammals like wild dogs and jackals. Long hairs growing from between their toes form a fur cushion over their foot pads. It helps to keep the feet insulated when the animal moves on hot sand. Their low set ears are believed to protect their inner ears from the wind-blown sand in the deserts. This adaptive feature is also useful for detecting subterranean preys. Their small and blunt claws, along with the fur covering the foot pads, make their tracks obscure and very difficult to follow. They have powerful paws that allow them to dig fast for catching underground preys. Their sand-colored fur often makes it difficult to spot them in their desert habitat, helping them to avoid being preyed on. The beginning of the mating season depends on various factors including the weather conditions of their distribution area. Populations from the Sahara Desert regions mate between the months of January and April. 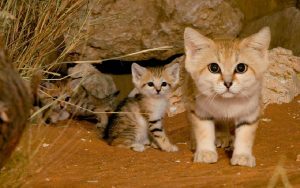 The mating season for the Sand Cats living in Turkmenistan starts in April while those from various regions of Pakistan mate during the autumn season, from September through the month of October. Both male and female cats become reproductively mature at around 14 months of age. Not much is known about their mating behavior and rituals, apart from that they call to attract mates. The female digs a burrow or finds an abandoned one large enough for giving birth to 2 to 4 kittens. One litter may contain anywhere between 1 to 8 babies, but 2 to 4 is most common among this species. Their gestation period can last anywhere between 59 and 66 days. They usually reproduce once every year, but in some regions, Sand Cats may have 2 litters each year. The kittens are born blind and helpless with their eyes opening after about 14 days of birth. They gain around 12 pounds of weight every day since birth and start walking by the 20th or 21st day. Sand kittens begin eating solid food after 5 weeks while they become partially independent between 3 months and 6 months of age. Their life expectancy in the wild remains unknown; but, they are known to life for up to thirteen years in captivity. The cats have a juvenile mortality rate of around 41% in their wild habitat due to the extreme conditions and numerous enemies. 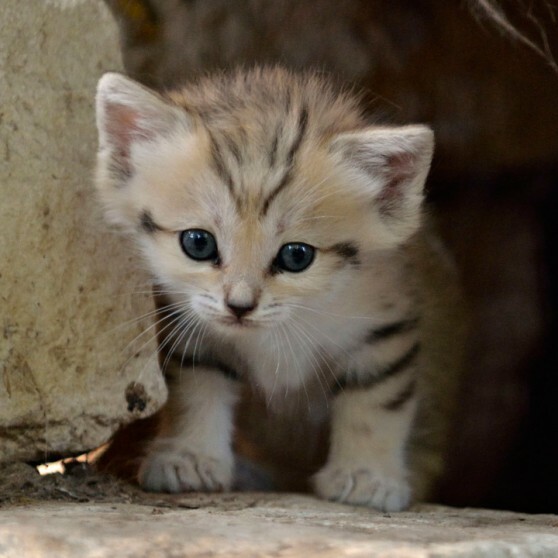 The Sand Cat does not make a good pet as their aggressive temperament makes it quite impossible to domesticate them. Additionally, it is very difficult to provide for them and one needs to have extensive training on how to take care of wild animals in order to keep them. 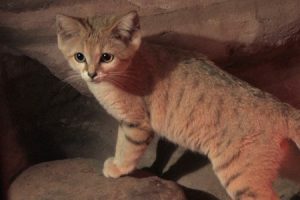 First of all, one should check with their local and state laws to see if it is legal to keep Sand Cats as pet. The cats should be provided with a wide living area containing sand and rock to resemble their natural environment. In captivity, they should be provided with foods like small animals and white meat. They are not used drinking plenty of water, so make sure to provide them with no more than the required amount of water. Drinking too much water can lead to some health problems as their bodies are adapted to dry and warm climatic conditions. They are quite prone to serious respiratory infections in captivity. So, it is crucial to keep them in arid enclosures with constant temperature and humidity levels. Like most other desert animals, they can survive for long periods of time without drinking. According to records, male Sand Cats can travel great distances as long as 3.1 miles to 6.2 miles (5 km to 10 km) in just one night. Respiratory diseases like upper respiratory tract infections are the most common cause of their death in captivity. They are included in the “Near Threatened” category by the IUCN. Change of climate, habitat loss and over-hunting are some of the main threats to their existence. Their populations are protected by various hunting prohibition laws in places like Iran, Algeria, Israel, Mauritania, Kazakhstan, Niger, Tunisia and Pakistan. However, there is no legal protection in Egypt, Morocco, Mali, Saudi Arabia, United Arab Emirates and Oman. Various wild life rescue organizations are taking necessary measures to prevent this species from becoming endangered as they are an important part of the desert ecosystem. Wow!! I didn’t even know they existed.